Thousand Suns from Rogue Games is perhaps the best emulation of Imperial Science Fiction – the subgenre best seen in the writings of Poul Anderson, Isaac Asimov, and Jerry Pournelle – in RPGs since your preferred version of Traveller. It offers a pleasingly simple approach to the subgenre that is relatively easy to modify to a setting of the GM’s choice, and for the players offers a means to create characters without the chance of their dying. 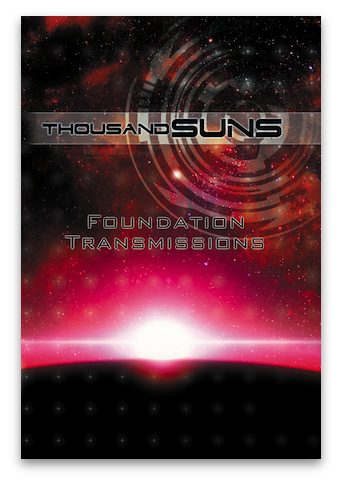 Foundation Transmissions is a companion volume for the game, bringing together a number of short articles that either expand upon aspects of the game and its provided setting or detail an aspect of the game not covered in the core rulebook. The other notable fact about Foundation Transmissions is that it has attracted a number of first time writers and artists. The first of Foundation Transmissions’ eight chapters is “Moving Through The Ranks,” which presents a means of handling rank and promotion in military Science Fiction games in the mode of Babylon 5, Star Trek, and Starship Troopers. It works by assigning three ranks to each of the Career Levels – Novice, Experienced, Veteran, given for the military paths in the game. Thus for the Navy career, the three given at Novice level for the Enlisted are Recruit, Able Spacehand, and Senior Spacehand, and for the Officers, Cadet, Subaltern, and Sublieutenant. During character creation, each rank grants the player extra Skill Ranks to assign, but their main purpose is to handle eligibility for promotion during play. As a campaign progresses, a player tracks his character’s earned Experience Points and once he has accrued enough, the character is eligible to be promoted from his current rank to the next. This need not be automatic and so presents opportunities aplenty for roleplaying. For example, why is a character not being promoted when he has accrued enough Experience Points or in-game, enough time in service? Or it can act as a reward for heroic action during play. In addition, the gap between each Career Level acts as a natural break between ranks. For example, Sublieutenant Matsue Nioko cannot be promoted to the rank of full Lieutenant, which is at the Experienced Level for the Navy, unless he has, as a character, increased his skills to a required minimum. The second chapter is devoted to the art of the con trick. “The Ways of Scheming” is all about pulling the long trick from a planetary to the galactic scale, much in the mode of Harry Harrison’s Stainless Steel Rat series or the television series, Firefly. It builds on Thousand Suns’ Social Combat mechanics, with the players needing to set their objectives – rig an election, bring down a government, or conduct corporate espionage, for example; their methods – bribery, extortion, infiltration, surveillance, and so on; and their assets – people, adoration, and so forth before the GM. These factors are used to generate the modifiers that will affect the rolls for the final skill checks. Unfortunately, the article leaves the reader wanting, the problem being the lack of application and the lack of examples, so we never get to see the mechanics working and the author’s intent brought to fruition. Where the previous “Moving Through The Ranks” is easy to apply to a game, “The Ways of Scheming” is less so, being in places a touch obtuse. There is the obvious use in that any scheme can used as a framework for a campaign, perhaps with the players gaming out individual parts of the scheme, such as breaking into a bank to place a certain piece of evidence. Yet it could have been made obvious and easier to use if there had been a full example provided so that the GM could see a full scheme as the author intended. There is clever intent here, but poor editing has prevented it from being brought to the fore. With “The Aurigan: Nomads of the Thousand Suns,” Chapter three introduces us to a new alien race. They are a biomechanical arthropod, upright turtle-like species fleeing the death of their home world and travelling aboard their massive starships through Thousand Suns space. Renowned tinkerers with a love of mechanical devices and particularly pocket watches, little is really known about the species and interaction is rare, except the occasional Aurigan which signs on as a passenger aboard commercial vessels. Although details are provided that they can be played as player characters, Aurigans are intended to be used as an NPC encounter, their being too alien for some players to roleplay. To that end, some encounter ideas would have been welcome. The title of the fourth chapter, “Planets of the Core,” is pretty much self-explanatory, detailing the twenty or so worlds of the Meridian sector. Every planet is given its primary terrain, gravity, climate, atmosphere, government, tech level, and population as well as a quick thumbnail description. The planets themselves are a varied lot, with a cliché or two included, and perhaps could have done with a bit more description than is given. Still, this sector is easy enough to add to an existing game. Chapters five and six, “Custom Weapons” and “Custom Protection,” are essentially the two sides of the same coin. Their rules enable a GM or player to design new arms and armour, customised or otherwise, beginning with the base concept and technological base before adding refinements. Together these determine cost, weight, damage, rate of fire, and tech level as well as a new value, concealment, for weapons, and armour value, dissipation value (protective against energy weapon fire), weight, bulk, and cost for armour. The system is really easy, so melee weapons and leather armour can easily be created as can advanced plasma rifles and powered battle armour. So for example, here is an attempt to do “Vera,” Jayne’s Callahan full-bore autolock from Firefly. It uses the assault rifle as the basis with the Assault Rifle, Spread Shot, Barrel Extension, and Revolving Magazines refinements to reflect the fact that it can fire both rifle and shotgun ammunition. Its magazines do not revolve, but rather the ammunition type is changed. This is reflected with two sets of stats for the gun. The first is for when it is fired as a rifle, the second when fired as a shotgun. What the previous chapters did for arms and armour, the seventh, “Robots and Androids,” does for all things robotic. Again it works much the same way, but here the GM selects a technological level or Class for his robot, from the Class V semi-autonomous models up to the synthetics of Class VII and the metallic liquid metal models of Class VIII. The obvious cues for the latter two are the Tyrell Corporation’s Nexus-6 model of Blade Runner and the T-1000 Terminator of the later Terminator movies. These are not just rules for the GM to create and design his own robots and androids, but for a player to create and play a robot character, either a mechanical android or a biological synthetic. Still, ready to play fully designed examples would have been useful. Chapter eight, “A Space Farer’s Introduction to Lingua Terra,” rounds out Foundation Transmissions. It presents a short guide to the pronunciation of the constructed international language, Esperanto, along with five pages of common words and words pertaining to the Thousand Suns setting. The aim here is not teach either the GM or his players how to speak Esperanto, but rather to help add flavour to said setting with just a little detail. Physically, Foundation Transmissions is a nice little softback book, with a neat and tidy layout and an array of decent artwork. What lets it down is the editing. Some of the writing should never have made it this far and really should have been sent back to the relevant authors for clarity. There is a great deal to like about Foundation Transmissions. “Custom Weapons,” “Custom Protection,” and “Robots and Androids” round out the technical aspects of Thousand Suns, whilst other chapters such as “Planets of the Core” and “A Space Farer’s Introduction to Lingua Terra” add to the setting. Although there are places where both a better edit and more detail and examples would have been both welcome and useful, Foundation Transmissions still provides the GM with plenty to work with and use in his game. I had a blast writing that stuff and seeing it published (I *love* TS), but I haven't seen that many reviews of the book. Thanks for taking the time to do so! Thank you for your kind comment. I am always happy to review books from Rogue Games - they are always entertaining.